The Advanced Bestiary for the Pathfinder RPG is on its way to print, and that means it’s now available for pre-order! 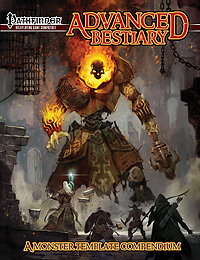 When you pre-order the Advanced Bestiary, you can get the PDF version of the book for just $5! In our online store you’ll be offered the PDF at checkout when you have the pre-order in your basket; participating retailers will be able to get you a coupon code for our online store that will provide the same deal on the PDF when you pre-order the hardback through them. Pre-Order the Advanced Bestiary for the Pathfinder RPG today!